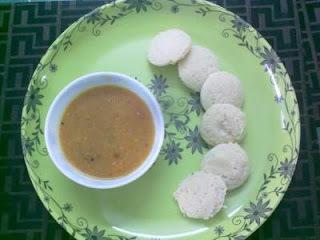 Idli sambar is one of the most famous south Indian cuisines around the globe.It's a very healthy breakfast option for all of us right from kids to elders.Although there are many ways of preparing sambar the above recipe is very similar to the one you would get in authentic south Indian restaurants. Wash the urad dal and soak it in water for 7-8 hours. Grind the dal with minimum water. Now mix the ground dal with rava.Add some water if required. The batter should be of medium consistency(not very thin or thick). Keep the batter covered outside the fridge for the entire night for fermentation. Next day morning add salt and soda to the batter. Grease the idli stand with some oil/ghee. Pour small scoops of batter into the idli moulds and steam them in a pressure cooker. Pressure cook the toor dal with salt and haldi powder till soft.You can add some vegetables along with the dal like carrots, potatoes. Then add chopped tomatoes and let it cook till soft. Once done add the cooked dal and veggies. Separately dry roast some urad dal,chana dal,toor dal,red chillies and freshly grated coconut. Grind all these to a fine paste. Add this paste to the above cooked dal. Add water to get the desired consistency of sambar. Add tamarind pulp to adjust the tanginess and sambar powder. Add salt as per taste and a pinch of sugar. Finally five a tadka of mustard seeds,curry leaves and red chillies to it.